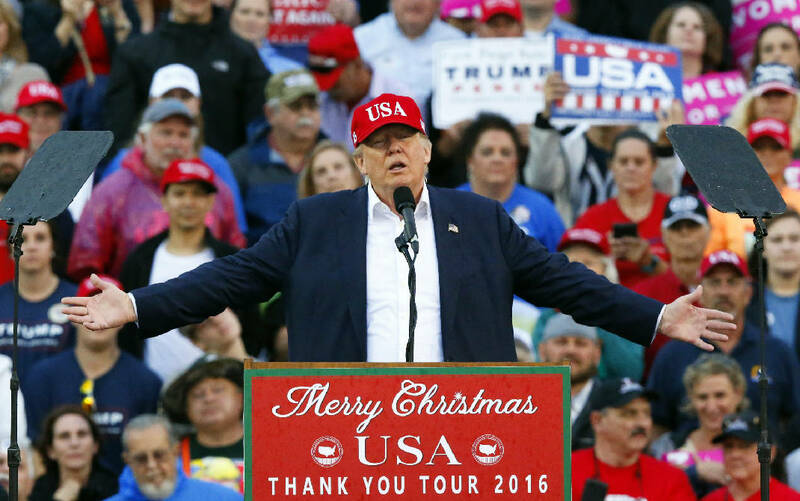 WASHINGTON (AP) - President Donald Trump is holding a campaign rally Saturday in politically strategic Florida - 1,354 days before the 2020 election. The unusually early politicking follows a pattern: Trump filed his paperwork for re-election on Jan. 20, Inauguration Day. By comparison, President Barack Obama didn't make his re-election bid official with the Federal Election Commission until April 2011. Huge rallies were the hallmark of Trump's presidential campaign. He continued to do them, although with smaller crowds, throughout the early part of his transition, during what he called a "thank you" tour. The Florida event will be his first such one as president. "I hear the tickets - you can't get them," Trump said Thursday during a meeting with lawmakers. "That's OK, that's better than you have too many." Trump responds well to the supportive crowds, who often chant, cheer and applaud enthusiastically when he speaks. The rallies serve a practical purpose by enabling his campaign to continue building a list of supporters. To attend, people must register online, giving their email address and other personal information that the campaign can use to maintain contact and raise money. Trump's upcoming evening event is set for an airport hangar in Melbourne, Florida, and it comes as he makes another weekend trip to what he calls his "Winter White House," his Mar-a-Lago resort in Palm Beach. Trump also said he would play golf this weekend with Ernie Els, a South African professional golfer. It will be his Trump's third consecutive weekend at Mar-a-Lago. White House spokesman Sean Spicer said the rally is "being run by the campaign." It follows an official trip Friday to South Carolina, where Trump will visit a Boeing facility in North Charleston. Spicer and others at the White House have not responded to repeated questions about why Trump's embryonic campaign is organizing this rally, or about who will pay for the event and transportation to and from it. Presidents regularly hold large campaign-style events to build support for their policies. Those events are often considered part of their official duties and organized by the White House. Michael Glassner, executive director of Trump's campaign committee, also did not respond to questions. Trump's campaign is running the event because Trump does not want to spend taxpayer dollars on it, a person close to him said. The person requested anonymity to discuss private conversations. Trump's campaign account had more than $7.6 million in the bank at the end of the year, according to fundraising reports. He's continued raising money postelection by selling popular merchandise, such as the ubiquitous red "Make America Great Again" ball caps. Although Trump is getting started far earlier than his predecessors, it's common for presidents to combine political and governing events into the same trip. When that happens, the campaign picks up the tab for part of the trip and taxpayers for the rest.